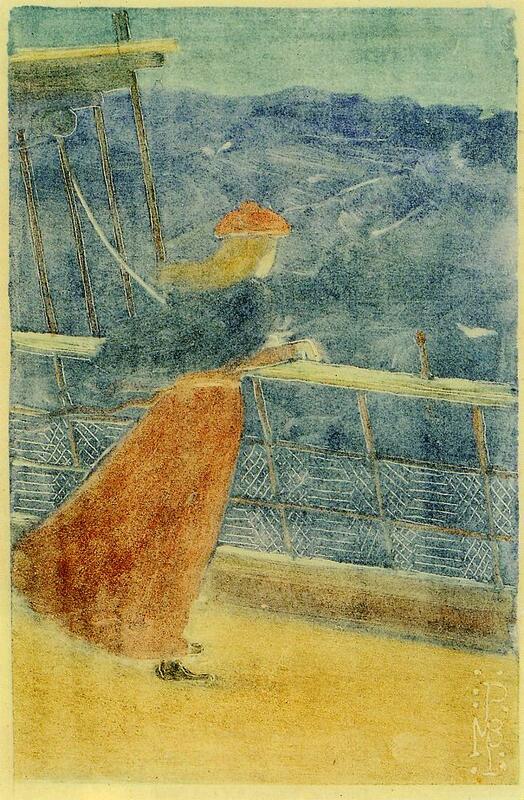 Detail from Woman on Ship Deck, Looking out to Sea, circa 1895, monotype on cream Japanese paper by American artist Maurice Prendergast (1858–1924). Click on image to see the full painting. Courtesy of WikiArt. In early 1877 Ambrose Bierce was hired as associate editor of the Argonaut, a new San Francisco magazine. Although the publisher hoped to make it a political journal, Bierce had plans to rival such literary reviews as the Overland Monthly (edited by Bret Harte), which had published his first story six years earlier. In the debut issue of the Argonaut, Bierce announced, “It is my intention to purify journalism in this town by instructing such writers as it is worthwhile to instruct, and assassinating those it is not.” Wielding his pen as a weapon, he particularly savaged local scribblers who fancied themselves poets. During his two-year stint on the Argonaut staff, Bierce “returned to his lifelong obsession with the macabre,” according to biographer Roy Morris Jr. Mixed in with rants against bad poetry, political misconduct, and sloppy journalism were numerous accounts on the region’s more grisly murders and suicides. Bierce also collaborated with two friends on a literary hoax called The Dance of Death, by “William Herman,” which condemned—using unabashedly lewd language—the “shameless gratification of sexual desire” caused by the latest fad to hit the San Francisco culture scene: ballroom dancing. 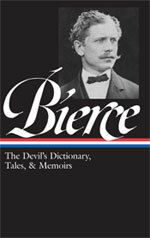 Bierce then wrote a scathing review of the book (“an indecent exposure of the author’s mind!”), which he published in his own magazine. Endorsed by gullible religious authorities who believed the work to be a sincere effort, the book sold eighteen thousand copies. Although his writing appeared in every issue, Bierce wrote only two new short stories for the pages of the Argonaut—his first pieces of fiction in several years. The second, “My Shipwreck,” appeared in the spring of 1879, near the end of his tenure. He later changed the title to “A Psychological Shipwreck” and included the story in his collection Can Such Things Be? 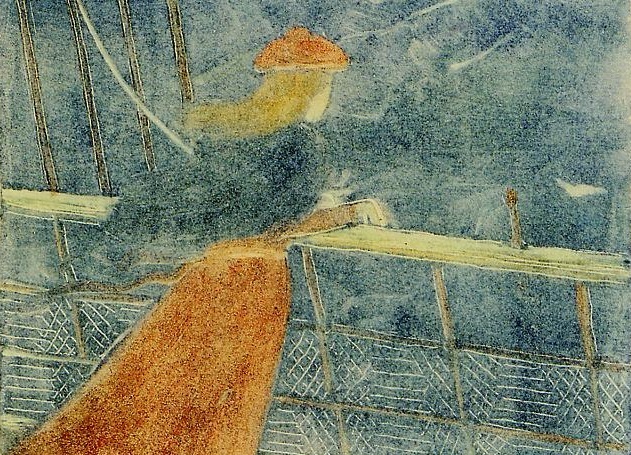 For over a century, “A Psychological Shipwreck” has been a favorite for inclusion in anthologies, particularly of weird tales or science fiction classics. Readers have puzzled and argued over how the clues scattered by Bierce throughout the compact, four-page story fit together. What is the relationship between Janette Harford and William Jarrett? Might they be distantly related? Is the other William Jarrett her biological father? And as for “Denneker’s Meditations,” the book that plays such a pivotal role in the story: don’t waste time looking for a copy in the library. It’s entirely the creation of Bierce’s storytelling imagination, although the fictitious author’s name seems to be a nod to Jost de Negker (often spelled Denekker in nineteenth-century sources), an engraver who published several editions of Hans Holbein’s infamous sixteenth-century series of woodcuts, The Dance of Death. In the summer of 1874 I was in Liverpool, whither I had gone on business for the mercantile house of Bronson & Jarrett, New York. . . . If you don't see the full selection below, click here (PDF) or click here (Google Docs) to read it—free!